I have been seriously slacking on books lately, I didn't even complete one full book for the month of April. I couldn't get into anything I read and probably spent way too much time flipping through cookbooks and magazines instead. I did however manage to read through two books this month and they both were fantastic. I'm excited to tell you a little bit about them. So let's get started! 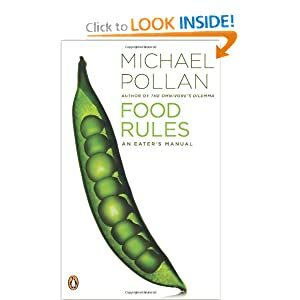 This is the first book of Michael Pollan's I've ever read. It's really short and quick to the point, which I liked. His philosophy when it comes to food is summed up in just three short statements- Eat food. Not too much. Mostly plants. There you go, can't get any easier than that! I'd like to share just a few of the listed "rules" that I particularly liked throughout the book. Don't eat anything your great-grandmother wouldn't recognize as food. Loved this one, common sense but one that we all struggle with. Shop the peripheries of the supermarket and stay out of the middle. This is how I've always done most of my grocery shopping, we try really hard to limit the amount of processed foods we buy. Not only are they not good for our health but they're also expensive and we simply can't afford that in our budget. The whiter the bread, the sooner you'll be dead. I'm still working on this one, I love my white bread, not so much store bought but homemade. I'm slowly incorporating more whole grains into our favorite recipes and I'm actually loving the flavor just as much. I've wanted to read this particular book for awhile now, it's been sitting on my shelf patiently waiting for me. During our little weekend trip to Arkansas it was the perfect opportunity to start diving in. I'd like to think my own girls are pretty good eaters, not too picky and we certainly do not let them live on traditional kid's foods like chicken nuggets and macaroni and cheese. After finishing this book though I'm not sure they would enjoy most of the traditional french dishes listed, it's true, french kids really do eat everything! Oh and snacks, yeah those don't happen in France like they do over in the United States. Typically one snack is served after school about 4:30 (they also eat dinner at 7:30, much later than I'm sure most of us do). I try really hard not to let my girls snack too often because I want them to actually be hungry for their meals. I've noticed some parents let their kiddos snack so often throughout the day that when it's time for meals, they're not even hungry. 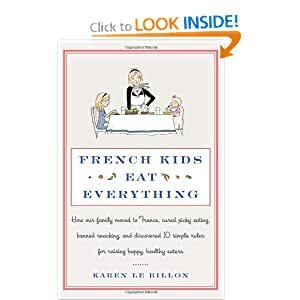 After moving back to her husband's hometown in France and being challenged by pretty much everyone there including her own in-law's; author Karen Le Billon decides to tackle her own two daughters' picky eating habits. Quickly discovering this wasn't going to such an easy task, she comes up with her own version of food rules to help make this transition easier. The real challenge would be moving back home to Vancouver and carrying out these newly learned "rules". I thoroughly enjoyed every bit of this book, if you're a foodie like myself I know you'll love it just as much. I also think it's a great read for parents in general, what parent doesn't want their children to eat a healthy variety of foods each day? Le Billon's story is entertaining and I think you'll find her strategies helpful in your own quest to conquer picky eating. At the very end of the book you'll also find a collection of nutritious recipes that her own family and especially children enjoy today. Of course I'm most tempted to try her chocolate mousse but the cauliflower casserole sounds pretty tasty too! I have wanted to read both of these books!! especially the French one! I'll give it a go!